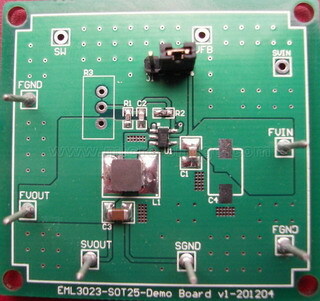 EML3023 is a high efficiency step down DC/DC converter. It features an extremely low quiescent current, which is suitable for reducing standby power consumption, especially for portable applications. The device can accept input voltage from 2.5V to 5.5V and deliver up to 1A output current. High 1.5MHz switching frequency allows the use of small surface mount inductors and capacitors to reduce overall PCB board space. Furthermore, the built-in synchronous switch improves efficiency and eliminates external Schottky diode. EML3023 uses different modulation algorithms for various loading conditions: (1) Pulse Width Modulation (PWM) for low output voltage ripple and fixed frequency noise, (2) Pulse Frequency Modulation (PFM) for improving light load efficiency, and (3) Low Dropout (LDO) Mode for providing 100% duty cycle operation during heavy loading. Adopting low reference voltage design reduces regulated output to 0.6V. The adjustable version of this device is available in both of TDFN-6 2x2mm and SOT-23-5 package.